7-way blackleg including red water, plus tetanus protection for cattle and sheep. 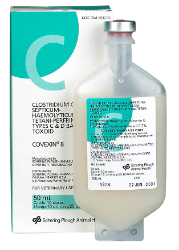 For prevention of Clostridium chauvoei, septicum, novyi, perfringens Types C & D, haemolyticum (bacillary hemoglobinuria/red water) and tetani. Dosage: Give cattle 5 ml IM or SQ. Repeat in 6 weeks and once annually. Calves vaccinated before 3 months of age should be revaccinated at weaning or 4-6 months of age. Give sheep 5 ml SQ, followed by a 2 ml SQ dose in 6 weeks and once annually.